Our own JERRY BEAN and SHIRLEY HARRY, cofounders of the Redlands Arts Festival will present an update and description of this second annual event. BEVERLY NOERR EXECUTIVE DIRECTOR OF REDLANDS COMMUNITY MUSIC ASSOCIATION Beverly updated the club on how the mission of the Redlands Bowl remains but the approach is changing to be fresh & responsive to changing audiences. Programming is evolving from a Legacy Model to a Team approach with fun interactive pre-show activities such as a bee hive hair doo contest during the musical Hairspray! The Community Sing is testing the waters with Community Spotlights of local talent. The icing on the cake is the new MC format that includes NATHAN GONZALES, RAY WATTS & LARRY BURGESS 3 Rascally Rotarians as some of the contributing emcees. Shirley Leonard, director of the Redlands Conservancy will discuss the newest initiatives concerning the Zanja trail and other projects that will improve the quality of life for Redlands citizens. lands Pool & Spa Center for underwriting the adult beverages. More details to come ~ let’s be courteous and RSVP with CHERYL RIGGSASAP! Keep in mind June is rapidly approaching and a Demotion Party is on the horizon. Thank you to PAT & ANNE MARIE for hosting ~ & for providing the Prez dunking pool! (not that this editor is trying to suggest anything) ~ Now we just need the actual date! URER CAL reports $40,000 funds raised ~ the best in 2 or 3 years!! JIM NOLIN, CAL BOOTHBY, ALLAN GRIESEMER, TOM ROGERS, and I have returned from District 5330 Conference. It was grueling (I’m an introvert), and so much fun all at the same time! I’ll relay a few of my favorite moments. On Saturday we watched the finals of the Four-Way Speech Contest. The students were very polished. None of them used notes (they were using notes when competing at our Club). 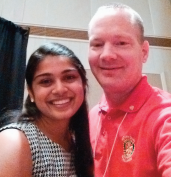 The winner was announced….. Shyamlee Nanda, sponsored by Sunrise Rotary Club! Ahhhh, wait a minute. WE sponsored her! Not to worry. When I led out in the Sunday lunch meeting I fined President Jeff Sceranka for taking the credit. Credit goes to our own BERNIE O’PREYfor organizing our Four-Way Speech Contest. Oh, we also wondered what the Vocational Training Team from India thought when Shyamlee began her speech with a description of getting off the plane in India and smelling a mixture of cow dung and body odor. The keynote speaker was Rotary International President representative PDG Julius Buski from the Edmonton Mayfield Rotary Club. Edmonton? Yes, the Edmonton in Alberta! Imagine my delight when we got to sing ‘O Canada’! I was probably the only attendee with my hand over my heart (besides Julius and his wife Nonie). No worries, I belted out the words and had the time of my life. District Conference was a great way to begin the process of wrapping up my year as President. Soon enough President-Elect JIM NOLIN will be taking over, proclaiming his own era of peace and prosperity without the weekly punishment that is the green hat.